Celtic Chaos is a band of traditional musicians from the Qualicum Beach area of Vancouver Island, British Columbia, Canada. 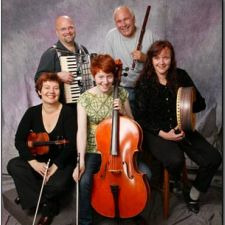 The group consists of Dave Barta on accordion, Emma Beaton on cello, Joyce Beaton on fiddle and les pieds, Jane Good on percussion, and Gordon Lafleur on Irish wooden flute and penny whistle. The band plays energetic reels and jigs from Scotland, Ireland and Cape Breton, mournful Gaelic airs, Swedish and Appalachian tunes, and French-Canadian dance tunes.